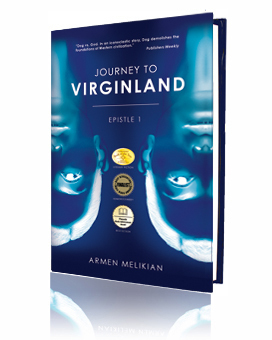 The word xenophobia is derived from two Greek words: xenos, which means “guest,” “stranger,” “foreigner,” or “a person that looks different;” and phobos, which means “fear,” “horror,” or “aversion.” In his debut novel, Journey to Virginland, Armen Melikian explores the roots and profound effects of xenophobia as manifested in Armenia and the several countries that play an interconnected role in the book. Xenophobia continues to be a core issue in many parts of the world today, defining the cultural discourse of various societies, helping shape national policy, and often leading to acts of violence against individuals or groups that are deemed too foreign or different to be acceptable to the mainstream. This phenomenon remains ubiquitous in modern life even though science has proven that, genetically speaking, there are no strangers in the world: the mitochondrial DNA of every person on the planet can be traced back to the mother of all human DNA, known as “Mitochondrial Eve;” and even though history has demonstrated again and again the moral and intellectual indefensibleness and ultimate uselessness of xenophobia – all that it accomplishes is to breed more ignorance, violence, and hatred. In Journey to Virginland, a novel that melds lush storytelling with philosophical and sociological inquiry, Melikian fixes his fiercely analytical and often humorous gaze on the many layers of xenophobia that impact Armenia and elsewhere. The Armenian people have long been affected by xenophobia, racism, and religious prejudice, falling victim to oppression, mass deportations, and genocide by conquering armies or occupying powers. But while Melikian eloquently studies the devastating effects of this phenomenon on Armenians, he goes one extremely important step further, by casting the floodlight of introspection on not only the types of xenophobia with which Armenians themselves treat others (especially including “other” Armenians), but also the flipside of xenophobia, that is to say, xenophilia, which stunts the cultural development of the Armenian people as it succumbs to a host of inferiority complexes brought on by a sense of inadequacy and self-abnegation. Interested in learning more about Xenophobia in Armenia? Get your copy of Journey to Virginland today!